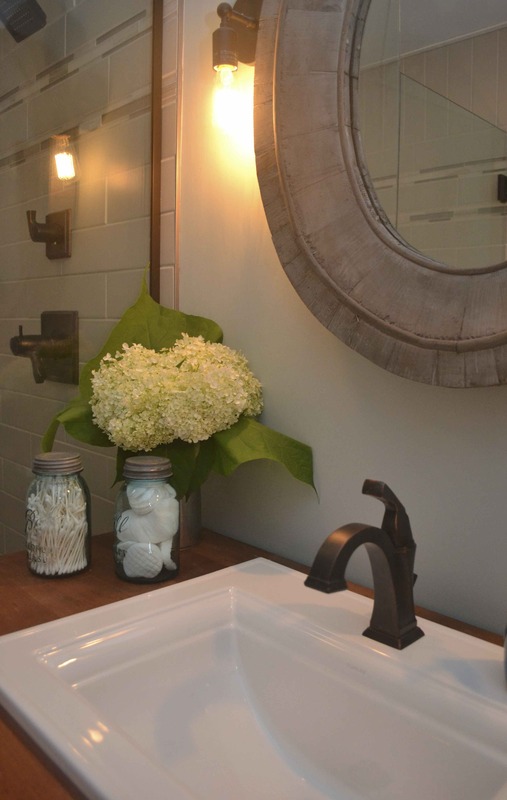 After almost one year in the making, our modern cottage bathroom renovation is done! As you can see we kept all the fixtures in the same place, as it’s a small bathroom and the layout worked well. However, with the rotting floor it moved to the top of our renovation priority list. On last fall’s trip to Brimfield, I scored this library table which after a FAT Paint and Wax makeover became my vanity. I painted the legs and shelf in Fat chalk paint and finished it with a light coating of antique and clear Fat Wax. I stripped the top and left it natural and just waxed it with the clear wax. 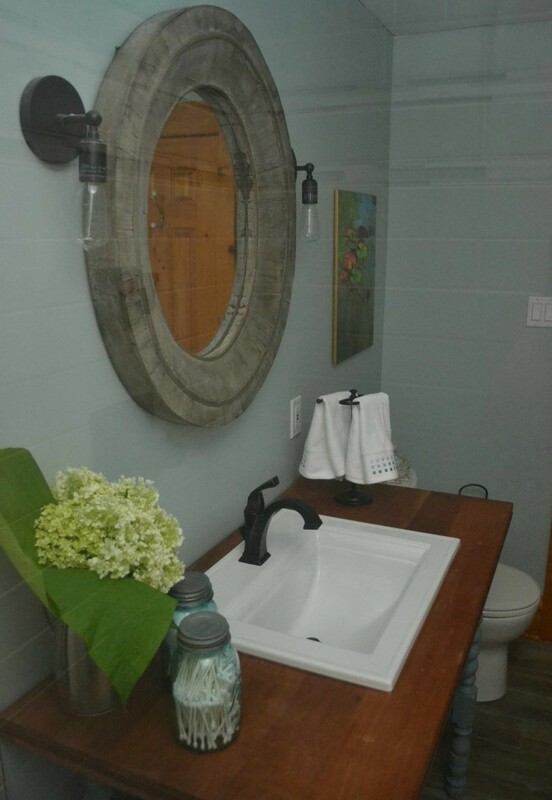 I wanted the vanity top to relate to the colour of the large pine baseboards and door that are in the bathroom and the rest of the cottage. 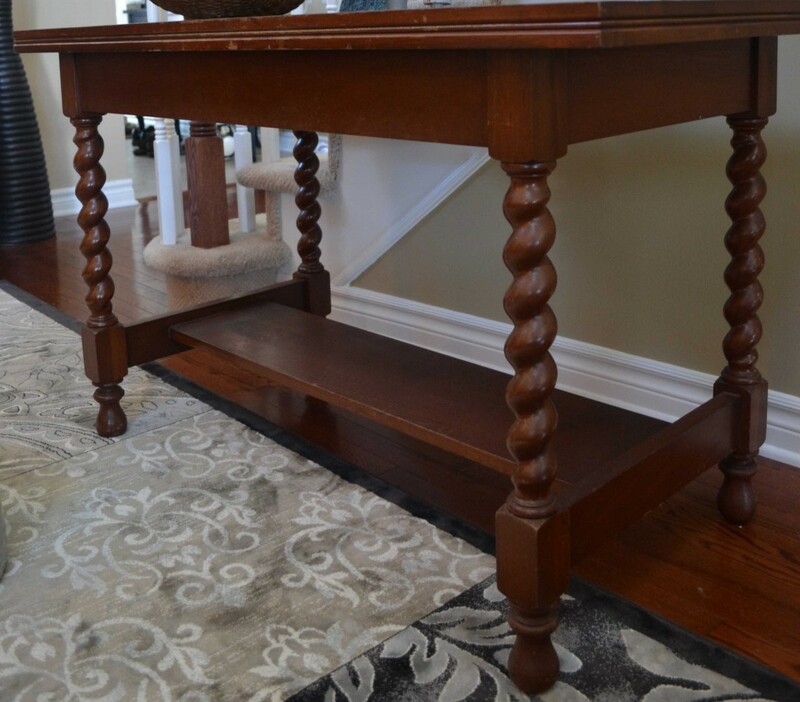 To read my full post about the table/vanity makeover, click here. Here it is in place. Delta was absolutely wonderful and provided me with the shower and sink fixtures from their Dryden Collection in exchange for this post and my honest review of their product. They are just beautiful, even better than I envisioned. Definitely the icing on the cake. 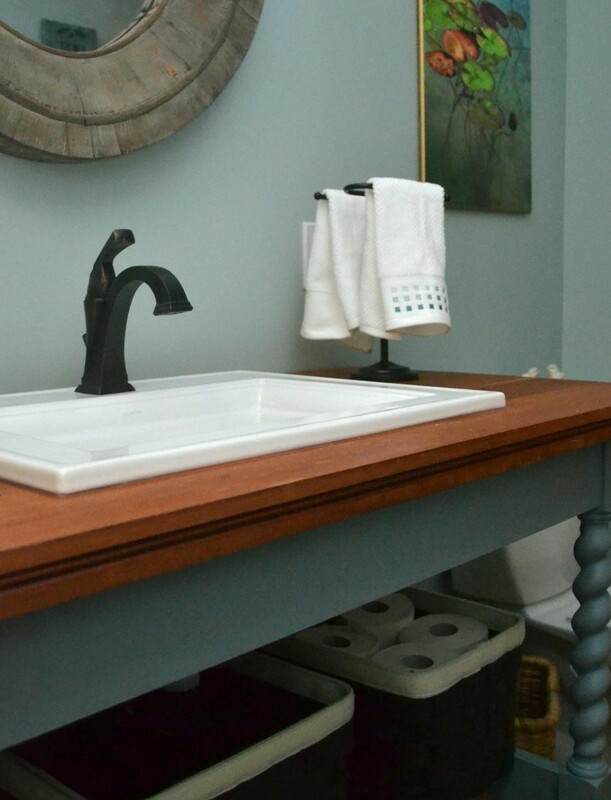 I chose a Kohler sink called Memoirs, to repeat the squares in the fixtures and it was the perfect fit for the library table. The Dryden faucet works very smoothly and is really heavy, which I adore, as the items you touch in design should feel just as beautiful as they look. It is also the first thing everyone comments on when they see the bathroom. With its’ art deco styling it was the perfect fit for my vision of this modern cottage bathroom. Obviously, I chose the oil rubbed bronze finish but it also comes in three other finishes, stainless, chrome and champagne bronze. The shower fixtures are equally gorgeous and do you see the size of the shower head? It has a wide waterfall spray and is pure luxury. We choose the TempAssure 17T Series for our shower as we wanted a toe tester because you have to get into the shower before you can turn the water on, and this way you won’t scald yourself. You set the temperature so that it is the perfect temperature, EVERY TIME, which in my opinion is just the best option. Once you have this, trust me you won’t know how you did without it, especially on those early, early mornings. This picture is taken from inside the shower through the glass, hence the reflections. 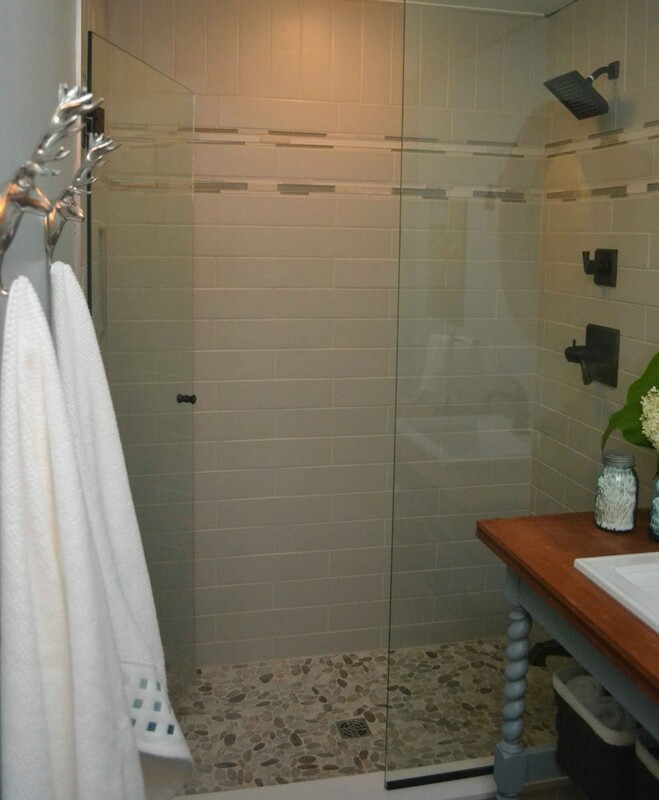 We were so fortunate that we were able to reuse the glass wall and door that was already in the bath. We updated the trim and the knob to an oil rubbed bronze finish, a little elbow grease and TADA it’s like we bought them new! Hubby’s face when I brought home a sample of the river rock tile for the floor was priceless. He wasn’t too sure how he was going to do it, but he did a fabulous job, not only with the river rock floor but the shower and entire bathroom in general. 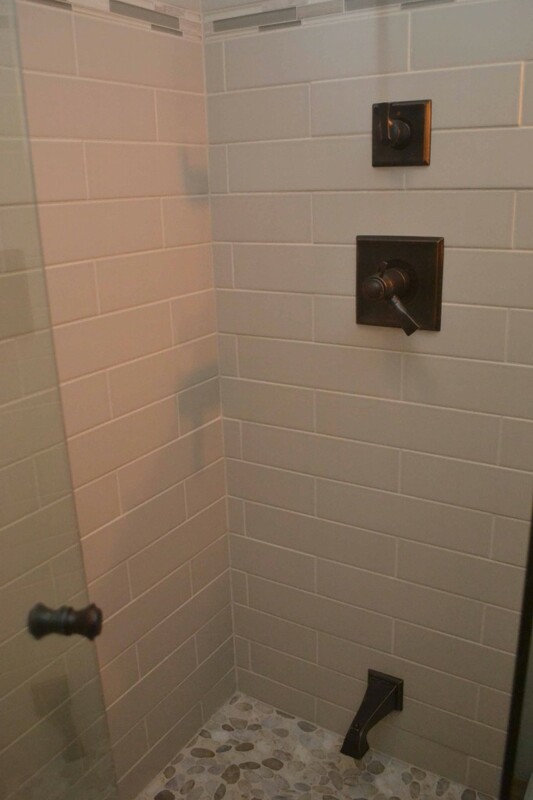 To help stretch our budget we used oversized subway tiles, laying them in a horizontal brick pattern for most of the shower and then vertically in a soldier pattern at the very top. 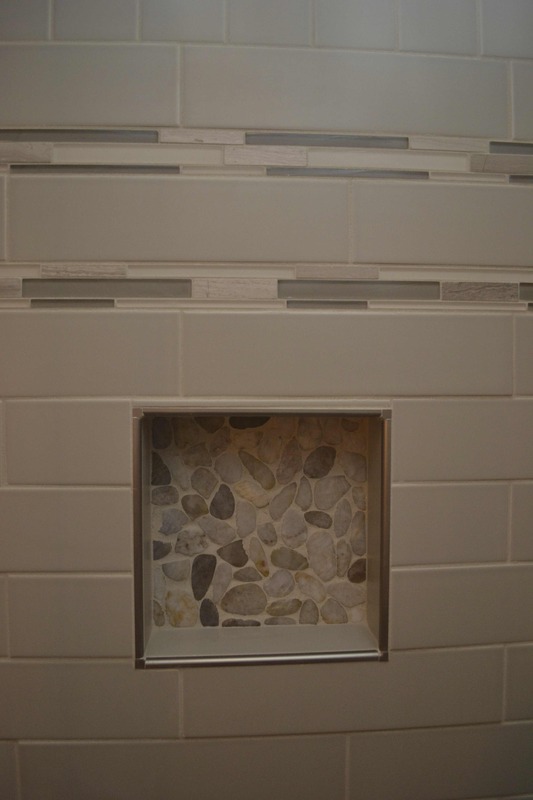 A few marble and glass accent tiles were also added for further interest. I picked up these cute little deer hooks for a cute touch of whimsey to hang your towels on. And let’s face it, kids are much more likely to hang up a towel on a hook than a towel rod. We repeated the river rock at the back of the niche, for a little added detail. 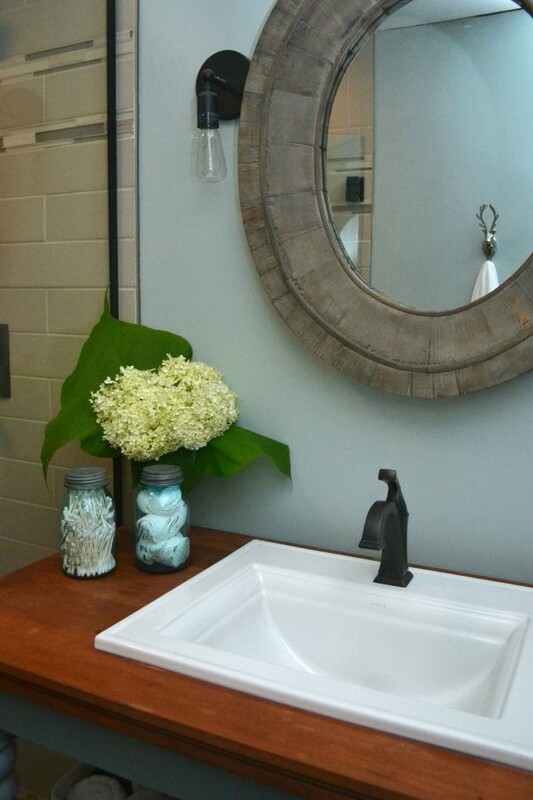 The barnboard mirror is from Restoration Hardware, it gives a rustic touch to the room (which nods to the fact that it is in a log home in the country), and it matches perfectly with the grays in the flooring. The lights are from Pottery Barn and I wanted something that would be bright as there is no window in this small bathroom and they would be the only real source of light besides the shower light. With their edison bulbs they fit the simple cottage rustic look I was going for. 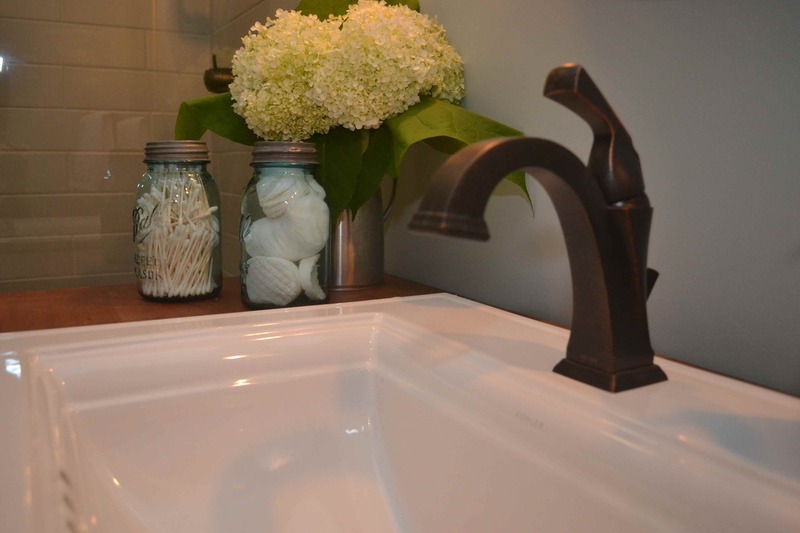 Since this is a guest bathroom, we didn’t need a ton of storage space, so three dark gray and cream felt baskets, from Home Sense, give the necessary amount and also help to hide the exposed plumbing. You can also see the artwork from a local artist that hubby fell in love with last winter, it has pride of place over the toilet, ha ha and ties in the aquas and blues used in the room. 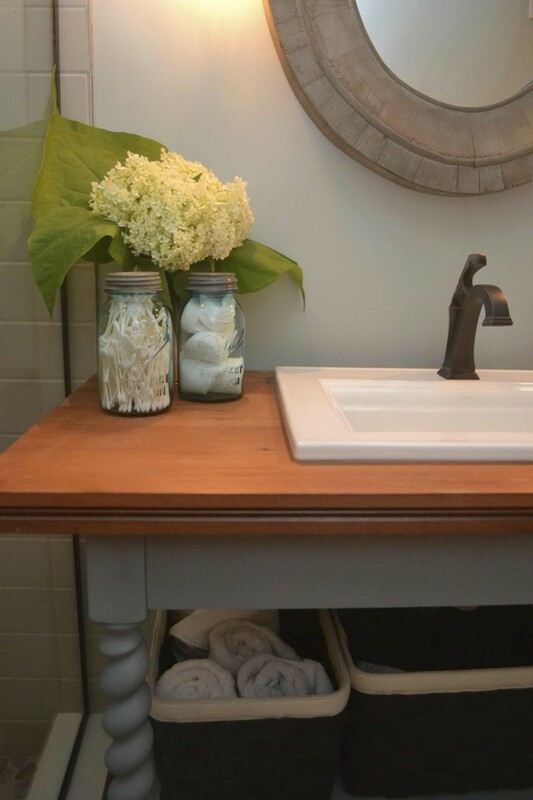 Here you can see the vintage aqua glass mason jars that I also picked up in Brimfield, as well as the wood look porcelain tile floor. I’m so in love with this floor, which we ran in the hall outside the bathroom and will eventually be in the nearby laundry room. 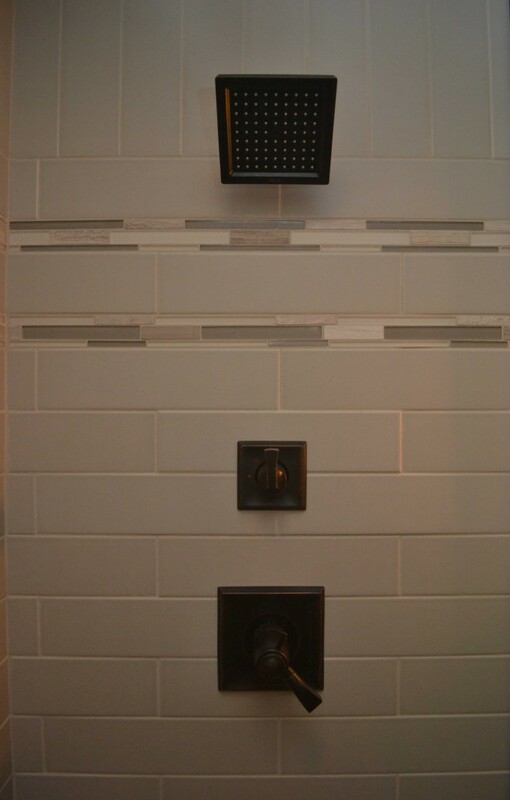 Oil rubbed bronze trim and knob finishes off the shower area. There you have it, another bath renovation completed! I’m so thrilled with this one, that I think it is time to move on to the next one! It’s so lovely, Lisa! Especially love the vanity. The bathroom is stunning! Beautiful work, I love it. Great work Lisa! Love the way it turned out! Thanks Andrew and pat yourself on the back, you had a hand in it as well. Thanks Cynthia I have had that mirror for months just waiting for it to go up. Wow, that turned out just gorgeous – I love your style!! Ah you’re sweet Heather. Thanks so much! Wow, what a transformation! 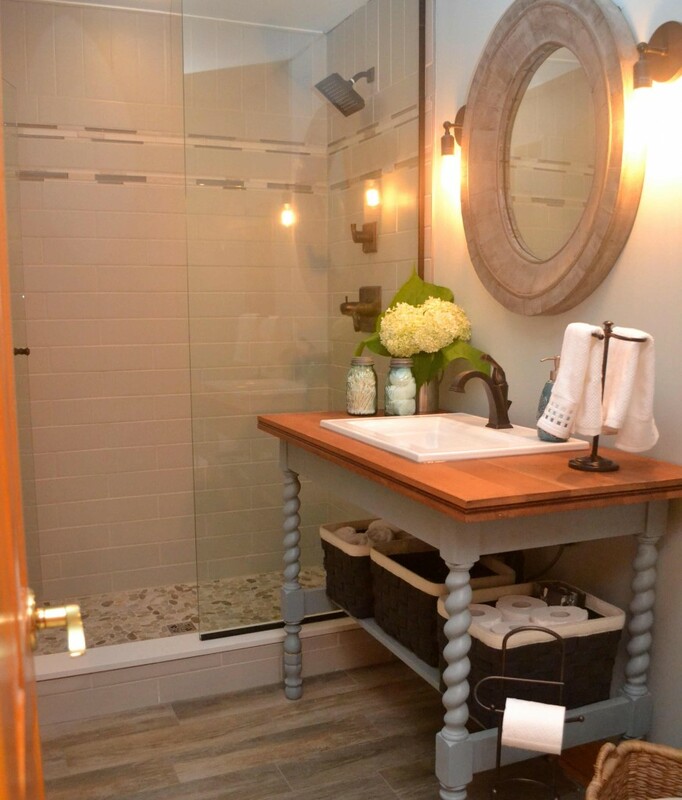 Love the table-turned-vanity and the bronze fixtures. Lovely! It is quite different even though we left the fixtures in the same place. Thanks for stopping by Kelly. what an amazing transformation. I love the mirror. So stunning. I absolutely love your transformation. 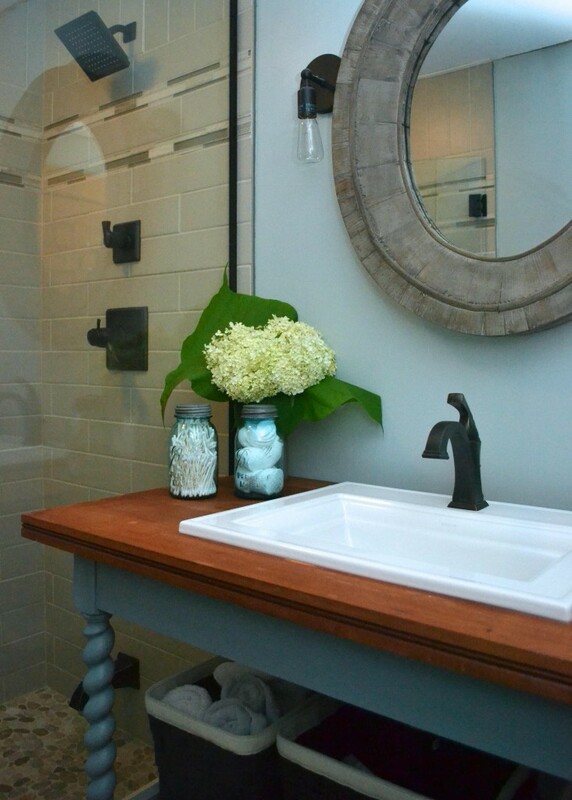 And yes, I love the vanity, the floor pebbles or the fixtures. 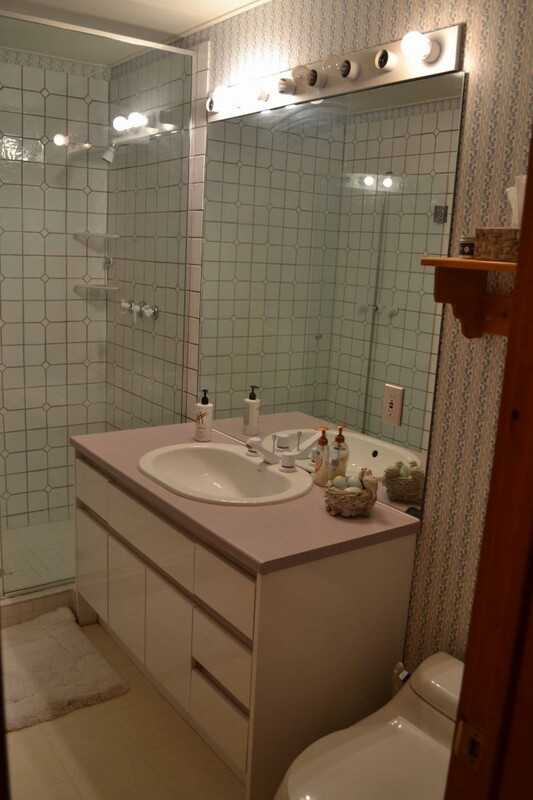 But what I appeciate a lot are the details: I love the hydragena in the bathroom, the jars on the countertop, that piece of art brings colour in the space and those deer towel hangers are too cute! The overall feeling is that of a very “loved” space! I like it when I find people who can make a room look ‘loved”!! Ozana you are making me blush. Thanks for your heartfelt and wonderful reaction. It thrills me that you’ve noticed all the little details that I’ve been anxious to get in there. Have a wonderful day! So beautiful! That vanity is gorgeous! Thanks Kathryn, I’m really happy with how the vanity turned out. I’m a sucker for barley twist legs. wow, what a reno! great job! and that vanity looks gorgeous. Thanks Dani. We are thrilled with it and the vanity turned out perfectly. Really beautiful! Love that little niche in the shower. Thank you Kelly. That niche too some work for me to convince hubby to do, but I’m so glad we put it in. Makes the shower so much neater with a place to put bottles and such. Wow Lisa! It looks amazing – great job! 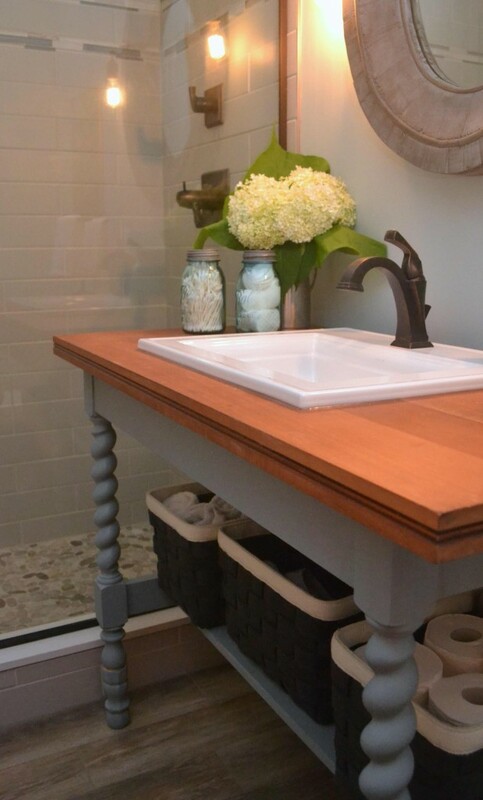 I love all the details, the vanity table and the Delta fixtures.